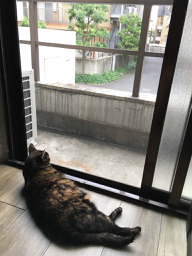 Oobie isn’t good in carriers, so I worried about her reaction to the nearly 24-hour journey from Los Angeles to our first short-term apartment in Tokyo. To my relief, she handled it like a champ. She complained a little on the flight from LAX to Seattle, but the engines and vibration put her to sleep shortly after takeoff, and she slept for most of the flight from Seattle to Tokyo as well. She woke up during dinner service–and ate the chicken breast I shared, as well as a single-serving container of cat food I brought along on the plane. 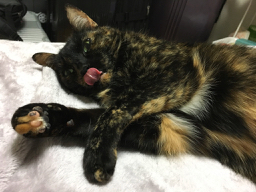 By the time we landed in Tokyo, Oobie had gone almost 18 hours without using the litter box. We had put a wee-wee pad in the carrier, too, but she didn’t use it. 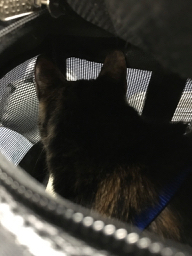 As soon as we deplaned at Narita Airport, I took Oobie into a large “priority restroom” (intended for use by families, persons with special needs, and people traveling with infants) and put down another litter box. At first, I thought she wouldn’t use that one either, but after giving the room a thorough examination she hopped into the box and relieved herself–and she really did look relieved. 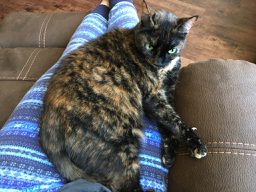 I didn’t know a cat could pee so much at once. With Oobie several ounces lighter, we headed for the customs desks. We cleared Japanese animal import in 20 minutes–well within the “under 12 hour” quarantine period we were approved for. Since our paperwork was in order (see the first installment of this post for details on what that involved) they cleared us as soon as Oobie passed the document and physical inspections. From there, we had an hour-long trip by train and subway to our rental apartment in Shinjuku. Many Japanese taxis don’t allow pets, so we decided not to risk it and used public transportation, where pets are welcome as long as you keep them inside a carrier and do your best to keep them from making a scene. Aside from a few meows of complaint–which our fellow metro passengers seemed to find more entertaining than annoying–we arrived at our rental apartment. Since we brought Oobie’s bed and favorite purple fuzzy blanket in our carry-on bags, she had “her things” immediately, and within a couple of hours she had made herself at home. Traveling to Japan with a cat both was and wasn’t easy. The requirements are significant–both before and during travel–but the steps were easy to follow. 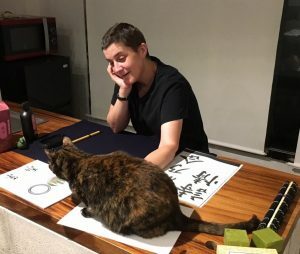 Since we followed the rules precisely the process went smoothly, and it was more than worth the effort to have our beloved Oobie with us in Japan. Do you travel with your pets? Do you find it difficult to do?